With its latest range of forged brake kits, D1 Spec offers you a good and right choice for improving your car's braking power. When it comes to upgrading or modifying your car, it's tempting to immediately think about changing the exhaust system or chipping up your engine. After all, who doesn't like a little more power and noise, right? However, what gets often overlooked is the car's brakes. It is arguably the first thing you should upgrade, and quite possibly the most important enhancement you can (and should) make to your car if you are hankering for more performance. Why is this so? Well, think about it this way. When it comes to performance, most people tend to only think in one direction - forward. And we don't blame them because manufacturers are always quoting 0-100km/h timings to highlight the performance of a car. However, any acceleration that takes place has to eventually be met by an equal decelerating force. It's a matter of the laws of physics. And that is where your car's brakes come in. Without good brakes to match your car's performance, the only thing left to slow the car down is the back of another car or perhaps a solid immovable wall. Upgrading to a good brake kit is always a good idea, especially from a safety point of view. With the bevy of new cars coming in to Singapore, one straightforward way of improving on road safety is to upgrade from the Original Equipment parts (especially so for the more affordable range of cars). 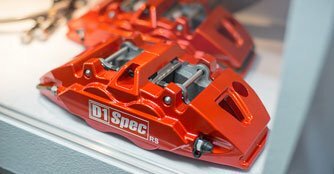 D1 Spec offers an affordable selection of brake kits aimed at helping you improve your car's braking performance and safety. It is a Taiwanese brand that has been around for more than 10 years, and is a popular global brand with products available in more than 30 countries. All parts of D1 Spec products are manufactured in-house to ensure a consistent high quality of its products. And over the years, its strong Research & Development team has continually collaborated with partners in Japan to improve technical knowledge, and to develop products that better cater to the different requirements of drivers. The latest range of brake kits available from D1 Spec are the RS Forged Big brake kits. These are cold forged aluminium brake kits that have been developed to be bigger and lighter compared to cast brake kits. NiBK six-pot Big Brake Kit upgrade and car parts worth $1,870 to be won! Need some help - what brakes are these?